This link is for the main restaurant located on the Hawaiian island of Oahu; the Moab restaurant is part of the Sing Ha Thai Restaurant Corporation. Being fond of Thai cuisine, we were looking forward to trying out Sing Ha Thai; several of Roy’s coworkers had eaten there, and said the food tasted good. We were to find out later on that there was more to the story than first told. To enter the restaurant, you need to walk up a set of stairs, past a couple of offices, and near the back is the entrance to the restaurant itself. The interior is smallish, too many tables, so you cannot help but see what your neighbor is eating, and hear their conversation. However, a friendly greeter will take you to a table, and then you can peruse the menu which is ala carte; there is also a tea menu. We ordered two appetizers: Spring Rolls, crispy, but with the typical large shreds of cabbage inside we’ve been seeing in Asian restaurants in the Four Corners area. Crab Rangoon, crispy wontons with smooth cream cheese, but tiny flecks of crab, so we were not sure if it was real crab or imitation. The main entrees were Chicken Pad Thai, not exactly what we were used to; while it tasted good, it had an unusual flavor we couldn’t identify. The Sweet and Sour Shrimp was very good; rice was extra though, and that seemed chintzy on their part, considering the prices charged for the menu items. The portions are not large, so if sharing, consider ordering more than one main entrée. At first we considered this a place to go back to if we were truly in the mood for Thai; however, we changed our minds several hours later when we both were not feeling very well. 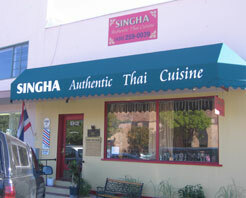 When Roy went back to work the next day, his coworkers asked him about his experience with Sing Ha Thai. He told them, including how we both fell ill the same evening. Surprise, surprise; his coworkers said they had experienced the same thing, but didn’t tell him, so he wouldn’t be negatively influenced beforehand. They couldn’t be sure if it was the food or not, but our experience, coupled with their comments, indicates it most likely was. Was it the large amount of shredded cabbage, the unusual taste we couldn’t identify? So, we will not be visiting Sing Ha Thai restaurant again. I agree this is not a great place. Bring some Thai into your Pad.